When it rains, it pours. 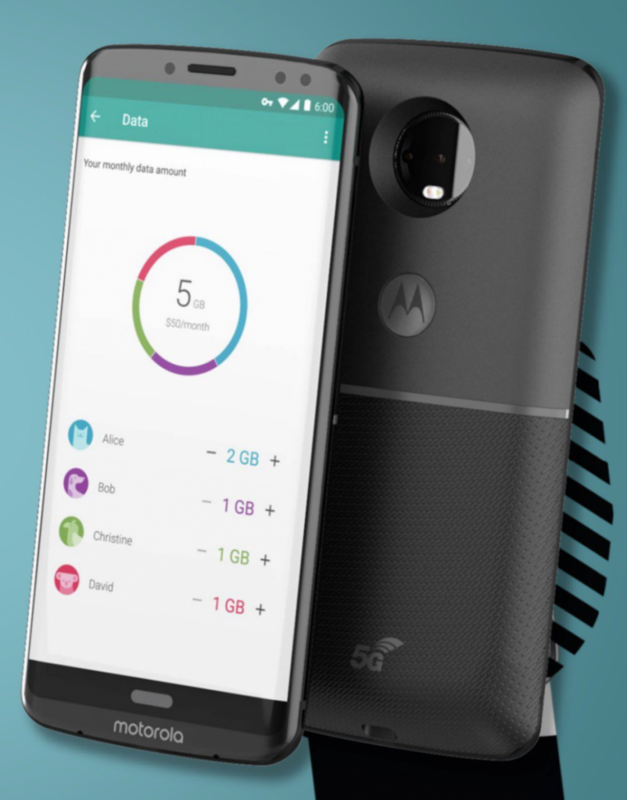 We’re used to seeing the Motorola release a number of smartphones across different series throughout the year — we’ve already written about press renders of the upcoming Moto E5. 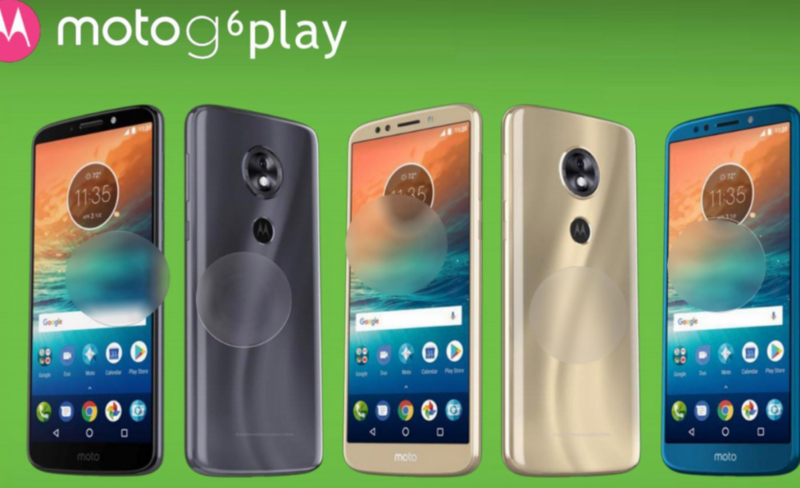 But this week, a good chunk of Motorola’s 2018 smartphone portfolio leaked in earnest — specifically the Motorola Moto X5, Moto Z3, Moto Z3 Play, Moto G6, Moto G6 Plus, and the Moto G6 Play. First up is the Motorola Moto X5, which leaked marketing materials describe as “Unlimited Premium”. 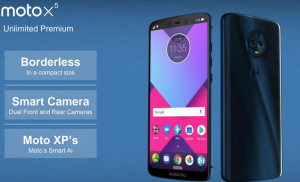 It looks to have an edge-to-edge screen and “borderless” design, plus a smart camera setup and something called “Moto XP’s”, some kind of artificial intelligence platform. There’s only one color option in the render, but that isn’t too surprising — the image appears to be part of a much larger collection. Digging into the hardware of the Moto X5, the phone reportedly has a 5.9-inch FHD+ display that follows the 18:9 trend popularized by phones such as the LG V30 and Samsung Galaxy S8. On closer inspection, it also seems to have a notch in the top bezel that’s not unlike that of Apple’s iPhone X. Another similarity between the Moto X5 and the iPhone X is the white bar right under the dock, which sits above the bottom bezel. It could but anything, but because the image doesn’t show a navbar, there’s a good chance it might house software navigation keys. 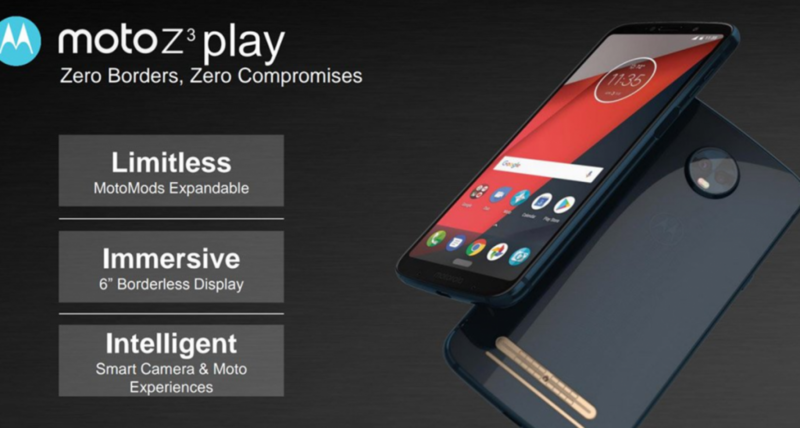 Next in line is Motorola’s upcoming flagship smartphone, the Moto Z3, along with its mid-range counterpart, the Moto Z3 Play. The first of the two leaked images show the Moto Z3 Play right next to the regular Moto Z3, and a never-before-seen Moto Mod attachment that reportedly adds 5G capabilities. Update 5/26/18: We have been provided an additional live photo of the 5G Moto Mod along with the Motorola Moto Z3 Play. You can view the image in our follow-up article here. Both devices are equipped with a 6-inch FHD+ (2160×1440) displays with 18:9 aspect ratios if the renders are to be believed, and rumor has it that there’s a third device in the Z series (not pictured) with a higher-resolution display. There’s a white bar at the bottom of both phones’ screens much like that on the Moto X5, suggesting that Motorola’s Z3 series smartphones will also have software navigation keys. And there’s aren’t fingerprint scanners in the bottom bezels of the devices, perhaps indicating that they’ve moved to the rear covers of the phones. Last up is Motorola’s affordable Moto G series. The three leaked renders show the Moto G6, the Moto G6 Plus, and the Moto G6 Play, and from what we can tell, Motorola based this year’s design off of last year’s Moto X4. The Moto G6 and the Moto G6 Plus both adopt a 18:9 aspect ratio, but the Moto G6 Play retains a 16:9 ratio. 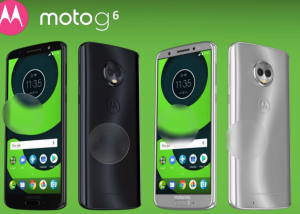 The Moto G6 reportedly has a 5.7-inch FHD+ panel, while the Moto G6 Play and Moto G6 Play have 5.93-inch FHD+ and 6-inch HD screens, respectively. (All three smartphones have curved “3D Glass” panels, according to the leaked specs.) As far as system-on-chips are concerned, the Moto G6 is said to use a Qualcomm Snapdragon 450 paired with 3GB/4GB of RAM and 32GB/64GB of storage, while Moto G6 Plus has a Snapdragon 630 paired with 3GB/4GB/6GB of RAM and 32GB/64GB of storag . The Moto G6 Play’s processor is currently unknown. However, we do have some information about the phones’ cameras and batteries. The Moto G6 sports a 3,000mAh battery and a dual 12MP+5MP rear camera and 16MP front camera, the Moto G6 Plus bumps that up to a 3,200mAh battery and a dual 12MP+5MP rear camera (with 1.4um pixel size) and a front-facing 16MP camera. Finally, the Moto G6 Play has a massive 4,000mAh capacity battery — the camera specs haven’t been revealed yet, though. 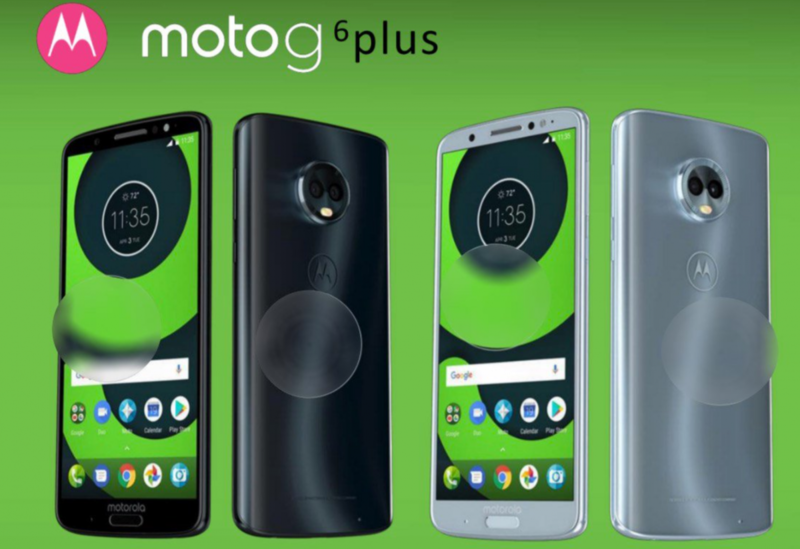 Pricing for the Moto G6 Play remains a mystery, but rumor has it the the Moto G6 and the Moto G6 Plus will be around $240 and $330, respectively.